It was like my soul could breathe for the first time in a decade when those words, without comparison or judgment could leave my lips. I am an artist. No excuses, pre-ambles or comments about art being a hobby. Because the truth is I HEART MAKING ART – for myself and for people like you. I LOVE MAKING ART THAT OPENS PEOPLE’S HEARTS to LOVE… most of all to themselves. 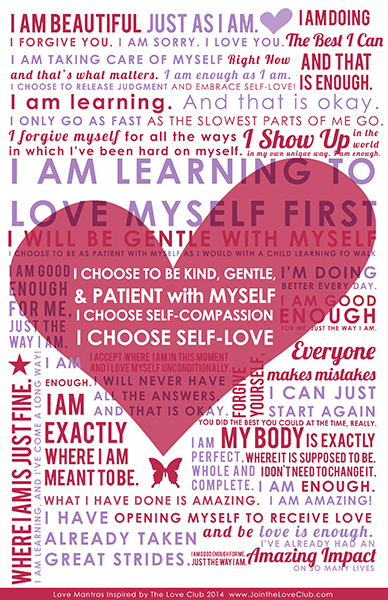 The piece you see to the left is the first in a series of graphic posters based on the 10-branches of self-love, this one full of Love Mantras that evoke the energy of self-compassion. My art is currently available to Love Club Members and through my Facebook site – but stay tuned for the public unveiling soon.